This is a pioneering textbook on the comprehensive description of AeroMACS technology. It also presents the process of developing a new technology based on an established standard, in this case IEEE802.16 standards suite. The text introduces readers to the field of airport surface communications systems and provides them with comprehensive coverage of one the key components of the Next Generation Air Transportation System (NextGen); i.e., AeroMACS. It begins with a critical review of the legacy aeronautical communications system and a discussion of the impetus behind its replacement with network-centric digital technologies. It then describes wireless mobile channel characteristics in general, and focuses on the airport surface channel over the 5GHz band. This is followed by an extensive coverage of major features of IEEE 802.16-2009 Physical Layer (PHY)and Medium Access Control (MAC) Sublayer. The text then provides a comprehensive coverage of the AeroMACS standardization process, from technology selection to network deployment. AeroMACS is then explored as a short-range high-data-throughput broadband wireless communications system, with concentration on the AeroMACS PHY layer and MAC sublayer main features, followed by making a strong case in favor of the IEEE 802.16j Amendment as the foundational standard for AeroMACS networks. 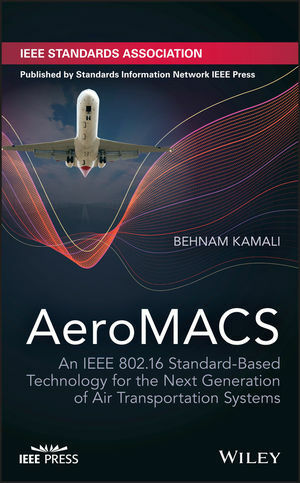 AeroMACS: An IEEE 802.16 Standard-Based Technology for the Next Generation of Air Transportation Systems will appeal to engineers and technical professionals involved in the research and development of AeroMACS, technical staffers of government agencies in aviation sectors, and graduate students interested in standard-based wireless networking analysis, design, and development. BEHNAM KAMALI, Ph.D., is Sam Nunn Eminent Scholar of Telecommunications and a Professor of Electrical and Computer Engineering at Mercer University, USA. Dr. Kamali has over 40 years of industry and academic experience in analysis, design, and implementation of digital communications systems, wireless networks, and digital storage devices. He is a Senior Member of the IEEE.Dr. Kamali has published over 100 journal and magazine papers, conference articles, and research reports, several of them on AeroMACS and WiMAX technologies. He has taught at, or worked for, 10 major universities across the globe. Dr. Kamali is a seven-time NASA visiting Summer Research Fellow at Glenn Research Center and Jet Propulsion Laboratory.